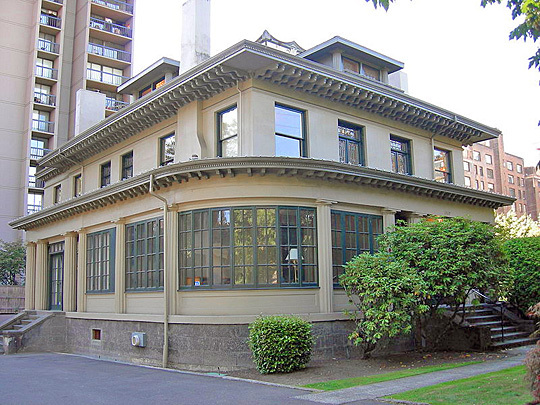 Photo: Henry H. Dearborn House (the Seattle Dearborn House), ca. 1907, 1117 Minor Avenue, Seattle, Washington. Dearborn [1844-1909] was an East Coast banker who made major contributions to Seattle's early development. Listed on the National Register of Historic Places in 1997. Photographed by Joe Mabel (own work), 2007, [cc-by-3.0 (creativecommons.org/licenses/by/3.0)], via Wikimedia Commons, accessed October, 2012. Seattle, the largest city in the Pacific Northwest, lies along Elliott Bay, on the east shore of Puget Sound, 128 miles from the Pacific Ocean. Built on seven hills, with intervening lowlands, it extends between Puget Sound and Lake Washington, which are joined by two canals and Lake Union. It is a city of steep descents and sudden turns with streets that fall away inevitably to the waterside, lined with docks and moored ships of every description. Many bridges, ranging from the imposing concrete George Washington Memorial Bridge to small spans straddling the ravines, pass between different parts of this city broken by water routes. Today  Seattle is one of the most important import-export cities of the United States. Its rapid growth is due in large measure to its commercially strategic location and to its terminal improvements. Four large railroad systems connect Seattle with the East and with the Southwest; and its position in relation to the short "great circle" route to the Orient gives it a substantial advantage in shipping over other west coast cities. Also, Alaskan shipping is centered in the ports of Puget Sound because of the greater degree of safety provided by the protected Inland Passage; it's the favored water route to Alaska from Seattle. The early settlers were largely of native stock, but as the city grew, Scandinavians and Finns were attracted by lumbering and fishing; Irish, Italians and peoples from the Balkan Peninsula found employment in construction and railroads, and Germans, French and English in the various service trades, the food industry, and the professions. Among the early arrivals were also Chinese, Japanese, Filipinos, Hawaiians, and Blacks. Among cities of the Nation with a population of 300,000 or more, Seattle ranks third in the percentage of home ownership. As in other large communities, residential districts are distinctly differentiated here according to income groups. With the growth of the community the better homes have steadily shifted toward the outskirts of the city, particularly to the highlands along Puget Sound and to the shores of Lake Washington. Yet those areas formerly favored by the well-to-do — First and Capitol Hills to the east of the metropolitan area, and Queen Anne Hill, the highest in the city, which looms north of Smith Cove — have not been entirely abandoned; and within a few minutes drive from the civic center many fine houses with lovely gardens and spacious lawns are still to be seen. Scattered throughout the city are many pleasant districts inhabited by families of middle income. Free from congestion, five- to seven-room dwellings cover an unusual portion of the city's space, and, owing to the moist and mild climate, their tenants have been able to surround themselves with flowers, shrubs, trees, and grassy lawns. Cheap electricity has helped to make these homes comfortable and up-to-date. Moderately priced apartment houses and hotels loom here and their among the low roofs of the cottages. Seattle also has its poorer districts and its slums and near-slums. In the industrial area of South Seattle, along the flats and the railroad tracks, in the saw mill district along the shore of the Lake Washington Ship Canal, and in the streets bordering on the metropolitan district are the habitations of the poor and underprivileged of Seattle. Many of these are slums, different in detail but not in character from those of the eastern cities and of Europe, crowded with unsanitary firetraps, some hastily constructed in the days immediately following the fire of 1889, others during the World War boom days. The rookeries and shacks immediately south of the business district house most of the city's Orientals; in the same area, rooming houses and cheap hotels provide lodging for large numbers of itinerant and seasonal laborers. Thousands of houseboats lie along the shores of Seattle's lakes, canals, and bays. Some, principally in the Lake Washington area, are commodious floating villas, with hardwood floors, electric lights, frigidaires, and oil burners. Others are fairly comfortable dwellings. The great majority of the water abodes are, however, substandard shacks, shakily constructed on the flats or on old pilings, where some float with the rising tide, then sink back to the muddy shallows. Today, low-cost housing units are being built to replace some of Seattle's slums, especially those of the Yesler Hill district, which has already been cleared for new construction. The first small band of settlers built their cabins on Alki Point. These pioneers came to Seattle from Illinois in a covered wagon led by Arthur A. Denny. While the main group rested in Portland, David Denny and John N. Low proceeded northward by land to Olympia, where they embarked on Puget Sound with Leander Terry and Captain Robert C. Fay on the latter's boat. On September 28, 1851, they sailed into Elliott Bay. Upon landing the learned from the Indians that a settler had taken a donation land claim a year before, near the mouth of the Duwamish River. Captain Fay and Low soon left, but Terry and Denny set to work building a cabin on the south headland of the bay. Soon Denny wrote to his brother: "Come as soon as you can. We have found a valley that will support a thousand families." Within 2 months, on November 14, the other members of the part, 5 families, consisting of 12 adults and an equal number of children, arrived from Portland on the schooner Exact. The group named the point on which they settled New York, probably in the hope that some day the settlement would become the metropolis of the West. Later, with a touch of humor, they added the word Alki, Chinook jargon for "by and by," and it is this latter name which today clings to the point where the pioneers first settled. Scarcely were the cabins finished and the families established in their new homes when the little settlement made its initial venture into what was destined to become its major industry—lumbering. Early in 1852 the brig Leonea, seeking a cargo of piling for the San Francisco market, anchored offshore. The load she picked up, 35,000 board feet of logs cut by the settlers from their claims, was the first shipment to leave Elliott Bay.